After Michael Jackson's phenomenal success with 'Thriller', it seemed like all of his siblings wanted a piece of the pie as well. 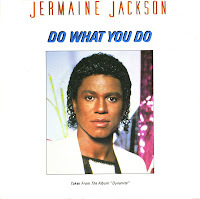 Janet Jackson started a very successful career together with Jimmy Jam and Terry Lewis, and Jermaine Jackson signed with Arista records to release 'Dynamite', an album featuring a couple of hit singles. One of them was 'Do what you do', which some say featured Michael Jackson on backing vocals. The main revelation for me was the music video at the time. I was already familiar with the fact that belly buttons can be 'innies' or 'outies', but I'd never seen a spine so deeply hidden in someone's back (scroll to 3'21 to see this anatomical phenomenon). Meanwhile, 'Do what you do' reached number 4 in the UK singles chart and the Dutch Top 40.